Spray tanning is a great way to gear up for your next special occasion. With Norvell Spray Tanning you can look your best without the wait of real tanning! 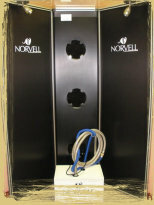 The specially made airbrush atomizes the "Norvell Spray" into a cooling vapor onto your skin ensuring an even application. The active ingredient in the Norvell Spray (a by-product of sugar), causes a chemical reaction with the amino acids on the outermost top layer of your skin to produce a bronzed tan - much like the sun does but without UVA and UVB damage to your skin. Your single tan application usually last between 5-10 days. \A9 T&C Tanning, 2011. All rights reserved.